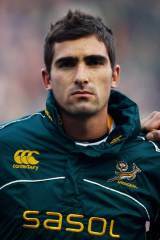 South Africa utility back Ruan Pienaar is one of the most naturally gifted young players in the world game, but has suffered in the early years of his career due to his versatility. Pienaar has international caps at scrum-half, fullback and fly-half but was unable to force his way into the reckoning for a regular place in any of these positions until 2008. With the Springboks' World Cup winning fly-half Butch James playing in Europe, Pienaar was handed the No.10 jersey for their autumn tour of the northern hemisphere, turning in assured performances and scoring a charge-down try against Danny Cipriani and England. Pienaar's career began with Free State, but he was given precious few opportunities before he made the switch to Durban and the Sharks after being spotted at Craven Week, a tournament for schoolboy players, by Sharks coach Kevin Putt. The son of former Springbok fullback Gysie Pienaar, he found new levels of success with the Sharks in both the Currie Cup and Super 14 and made his South Africa debut in 2006 against New Zealand during the Tri Nations. He was a part of the South Africa side that won the World Cup in 2007 and won praise before the tournament from Head Coach Jake White, who compared him to Australia fly-half Stephen Larkham. Pienaar made four appearances during the World Cup, scoring two tries against Tonga in his only start. He was an unused replacement for the final. In October 2008, Pienaar scored the opening try as the Sharks defeated the Blue Bulls to secure their fifth Currie Cup title. The following year he played in all three Tests against the British & Irish Lions and started the first two as the Springboks won the series. In the first Test his kicking proved decisive as he landed three penalties and two conversions in a 26-21 win but in the second Test he struggled and was replaced by Morne Steyn who kicked the winning penalty. Steyn made the 10 jersey his own during the ensuing Tri-Nations, in which Pienaar was used at fly-half and fullback. He announced in May 2010 that he would be joining Magners League side Ulster for the 2010-11 season, although he was recalled to the Springbok line-up at scrum-half for their thrid Tri-Nations game, against Australia in Brisbane. In July 2010 Pienaar confirms his Ulster career will begin at the start of September after agreeing a release from his Natal Sharks contract. And he quickly established himself as a talismanic figure for the Irish province.